This description and walkthrough will give users insights into the ‘Chrome is out of date’ popup virus and applicable techniques to remove it from infected Mac. The upsetting truth is that there is no such thing as a Mac immune to malware, unless it has never been online and the user hasn’t inserted any potentially booby-trapped removable drives into it. the stars hardly ever align that way, though. The offending code targeting Apple computers nowadays ranges from nuisances like adware, all the way to file-encrypting ransomware. The former type, incidentally, is the king as far as prevalence is concerned. These are annoying little culprits that inundate a user’s Internet journey with popup ads, fake alerts, and junk websites that would never be visited if it weren’t for shady traffic redirects. The “Chrome is out of date” virus is one of the strains that adopt this exact tactic in order to hoodwink the victim into installing a yet more harmful entity. 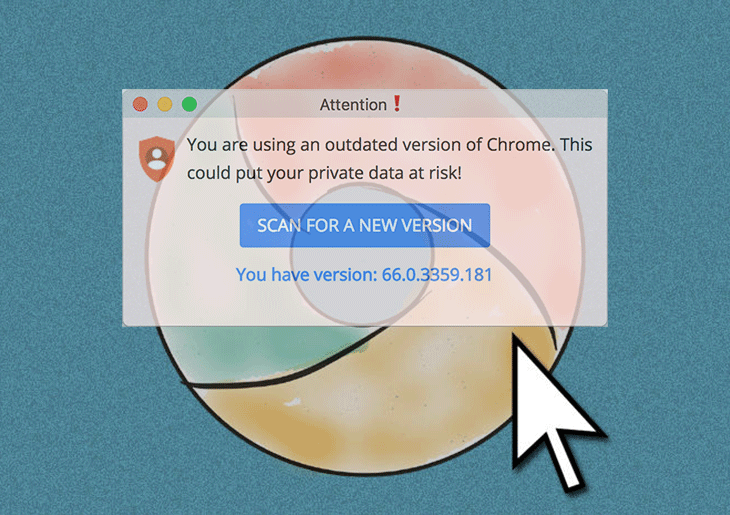 The logic of this attack is to display popup alerts in the Mac edition of Google Chrome that urge the unsuspecting user to apply a malware-tainted browser update. These misleading ads can assume a shape beyond the “Chrome is out of date” message. They might say, “Attention! You are using an outdated version of Chrome. This could put your private data at risk!” The major catch on these dialogs is all about the “Scan for a new version”, or similar, button. Once clicked, this element of the hoax will fire up a download of the associated program that’s not nearly as benign as it appears. In a relatively favorable scenario, the item being pulled in is a trojanized version of Chromium, which is a prototype of Chrome that’s open-source and has gained notoriety for being heavily abused and weaponized by malefactors. This way, the bad guys can drive traffic to certain sites that are hard-coded in the toxic browser in advance as the default search engine and homepage. Another likely upshot that will wreak more havoc is the installation of a more dangerous program, such as a ransom Trojan, keylogger, or backdoor. The “Chrome is out of date” virus may re-infect your Mac multiple times unless you delete all of its fragments, including hidden ones. Therefore, it is recommended to download Combo Cleaner and scan your system for these stubborn files. This way, you may reduce the cleanup time from hours to minutes. Download NowLearn how Combo Cleaner works. If the utility spots malicious code, you will need to buy a license to get rid of it. The obnoxious experience with the fake “Chrome is out of date” popups is preceded by a furtive infiltration of the virus into the Mac. This tends to be a matter of bundling, a process that normally helps freeware developers make a living by suggesting “special” extra offers that go with their apps. Unfortunately, adware distributors have been using this marketing method to their advantage for years. What they do is they embed potentially unwanted applications into these complex setups so that users install them while staying clueless about the stack of apps streaming into their Macs. The highly recommended thing is to go for custom install at all times, which will at least reflect the entirety of programs in the bundle. Not only does this unwelcome digital contrivance irritate the victim and pave the way for other threats to get in, but it also affects Chrome performance to a noticeable extent and poses privacy risks by harvesting PID (personally identifiable data) in the background. In other words, even if the user keeps rejecting the imposed pseudo update they will still be facing a number of adverse effects until the “Chrome is out of date” popup virus is removed for good. The Mac maintenance and security app called Combo Cleaner is a one-stop tool to detect and remove the “Chrome is out of date” popup virus. This technique has substantial benefits over manual cleanup, because the utility gets hourly virus definition updates and can accurately spot even the newest Mac infections. Download Combo Cleaner installer. When done, double-click the combocleaner.dmg file and follow the prompts to install the tool onto your Mac. Open the app and let it run the update of malware signature database to make sure it can identify the latest threats. Click the Start Combo Scan button to check your Mac for malicious activity as well as performance issues. When the scan is complete and Combo Cleaner returns the results, click the Remove Selected Items button and have the utility remove “Chrome is out of date” popup along with any other viruses, PUPs (potentially unwanted programs), or junk files that don’t belong on your Mac.